The Deluxe Spa Set includes Shampoo, Conditioner, Between Baths Spritz, and dog bath accessories (a bath sponge and rubber duck!). Available in Lavender or Peppermint/Tea Tree. 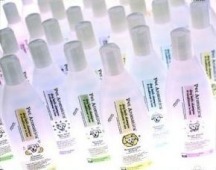 All products are All Natural and formulated for natural flea control. It is packaged in a vinyl bone-shaped bag, and makes a great dog occasion gift for doggie friends or friends with doggies. Includes the Every Dog Has His Day Spa Shampoo, Between Baths Spritz, and Paw Rub, along with a bathing sponge and rubber duck. 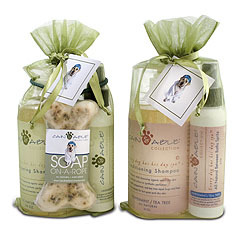 The pack is shrink-wrapped and makes a great gift for dog lovers. Available in Lavender (Lavender and Eucalyptus oils calm and refresh) and Peppermint/Tea Tree (Peppermint rejuvenates and Tea Tree naturally remedies dry skin and hot spots). The Shampoo/Spritz Gift Sets are packaged in an elegant, organdy bag and tied with a silk ribbon and gift card. Available in the Original Lavender scent or Peppermint/Tea Tree. Makes a wonderful gift for any occasion. Add the Soap-on-a-Rope to make it even more eye-catching. Includes the Every Dog Has His Day Spa Shampoo, Between Baths Spritz, Conditioner, and Paw Rub, along with a bathing sponge and rubber duck. The basket is shrink-wrapped and makes a great gift for doggie friends or friends with doggies. Available in Lavender (Lavender and Eucalyptus oils calm and refresh) and Peppermint/Tea Tree (Peppermint rejuvenates and Tea Tree naturally remedies dry skin and hot spots). This is a great way to try our products. It contains a 2 oz. shampoo, 2 oz. conditioner, and 2 oz. Between Baths Spritz, plus a Doggie Fortune Cookie. Available in Lavender (Lavender and Eucalyptus oils calm and refresh) and Peppermint/Tea Tree (Peppermint rejuvenates and Tea Tree naturally remedies dry skin and hot spots). For Dogs and their humans! According to the American Veterinary Dental Society, more than 80% of dogs suffer from periodontal disease by the age of two. Help your dog ward of bad breath, gum disease, multiple infections, and heart disease by consistently brushing your dogs teeth. 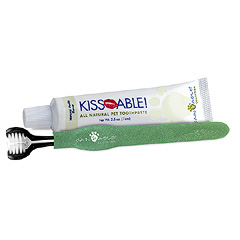 The unique design of the KissAble toothbrush makes it easy to clean all three sides of the tooth with one stroke. The soft bristles massage the gums while the firmer bristles clean teeth. The vanilla flavored toothpaste is All Natural and is great for dogs and their people! 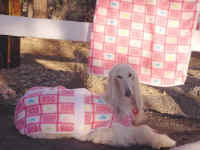 Towels for dogs and their human companions with your favorite breed. Camille showing off the line. Colors available: White, Black, Peach, Aqua, Red, Yellow. Please specify color upon checkout. 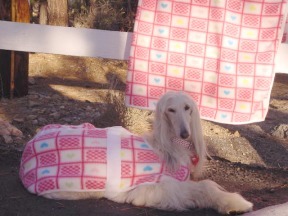 Paloma in her heart print fleece bathrobe and matching blanket and scarf, out for a stroll after her bath. Her Mother accompanies her in a complimentary red outfit. Mum's outfit: Crew 1 x 1 rib fitted 3/4 sleeve crew-Sizes S, M, L. Pants-Sizes M/OS-inseam 32", Size L-inseam 34". Paloma's outfit: Sizes XXS, S, M, L, XL. See sizing chart above. 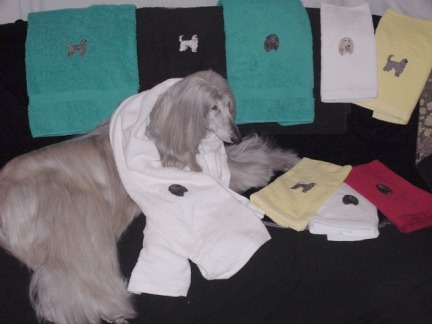 Phoebe sits beside her Chenile robes. Phoebe with a Daisy is shown here in her after Bathrobe. Please click here to see available colors. 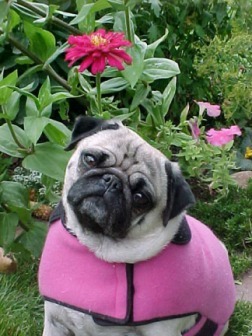 A macrobiotic alternative to chemically-derived dog coat deodorizers. Contains NO alcohol, harsh chemicals, pesticides, phosphates, dyes, or animal by-products. ph balanced for your dog's skin and coat. Comes in non-aerosol spritz bottles, custom made essential oil blends for fragrance. Woodsy Woof is scented with Eucalyptus which is a natural insect repellent, Fir needle, which repels lice and fleas, and Lavender, which helps relieve itching. Made with plant and vegetable based extracts, purified water, and aloe-vera to soothe your dog's skin and coat. Spritz on your dogs dry coat, brush through and enjoy the aroma-therapeutic benefits of your favorite essential oils. Our spritzers are also ideal for using in any room, or on bedding and furniture to freshen and cover pets unwanted odors. 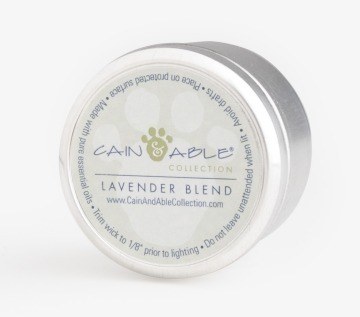 Illuminate the room with your favorite celestial scent for the home you share with your dog. Comes in 8oz container with lead-free cotton wicks and are hand-poured. Made with 100% pure soybean wax grown from US soybean farms. 30+ hour burn time. Custom made essential oil blends for fragrance from Eucalyptus, Fir Needle, and Lavender. Our exclusive one of a kind Dog Home Candles come with something for you and something for your dog. 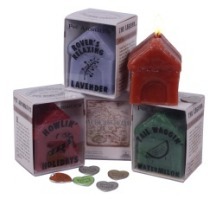 Fill your home with wonderful fragrance and as the candle burns wait for your lucky treasure to appear. Each candle comes with one of four different dog charms(tags) hidden inside - "Furry Angel," "Best Friend," "#1 Dog," or "Lucky Dog." 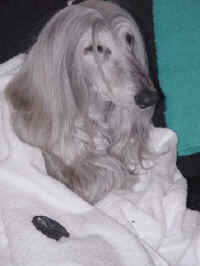 You never know what hidden treasure your dog home candle will reveal. Collect all four scents. The perfect gift for any and all dog lovers. Pet Aromatics 12 oz. 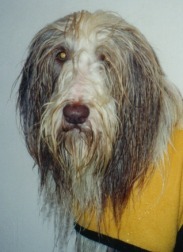 Dog Bath Shampoo/ Conditioner in 1. Contains NO SLS, DEA, TEA, alcohol, phosphates, pesticides, detergents, dyes, animal by-products. Made with the mildest plant and vegetable based cleansers. Macadamia nut oil, almond oil, oat flour protein and cucumber extract conditioning agents. pH balanced (6.75) specially for your dog's skin and coat. Vitamin enriched with pro-vitamin B-5. Demats and detangles. Rated excellent for use in hard and soft water areas. Contains natural anti-oxidant sequestering agent to help minimize buildup of trace minerals on hair shaft. 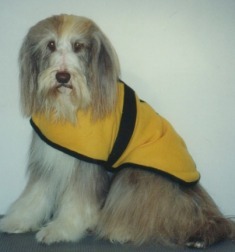 ChrisStix Color Coat from Chris Christensen, maker of dog show and show dog grooming products. No Mess, No Fuss. Non Toxic, Will not rub off or smear, Lasts until you shampoo. 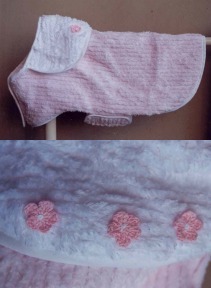 Covers stains & flaws, hides gray and eliminates unwanted colors in the dogs coat. Pinpoint accuracy and easy to blend, maximum staying power even after brushing out. 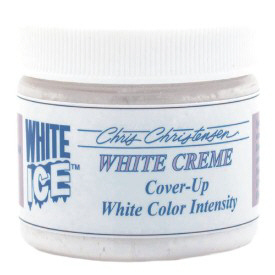 Unlike many grooming powders and chalks, ChrisStix has excellent coverage. 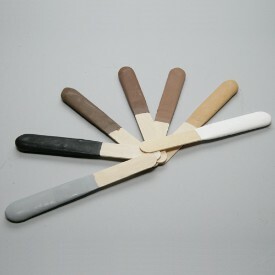 Available in the following colors: Black, Brown, Grey Blue, Ivory, Light Brown, Mustard, Red Brown, Rust, Tan, and White. Please specify color at the check out lane. White creme cover-up. White color intensity!